Well the set is done. The ribbons have been awarded and are affixed to the quilts. Margy won a few blue ribbons for her beautiful creations and I won some ribbons as well. 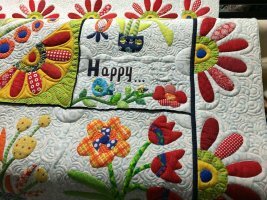 My "Happy" Quilt made me happy. 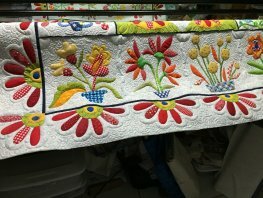 Having not hand appliqued an entire quilt for 15 years or better and to win a ribbon was encouraging. My Mom won a ribbon as well in our group catagory. So we were happy campers at our houses. And our former customers were big winners. 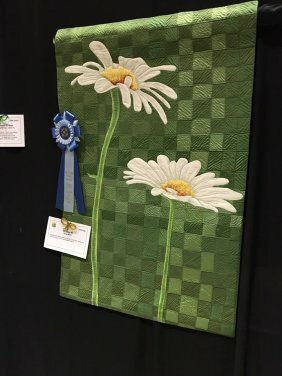 Sheila Q. won Best of Show with her beautiful hand appliqued piece and Theresa O. won quite a few as well. In fact all in all it was a good Award presentation for all. 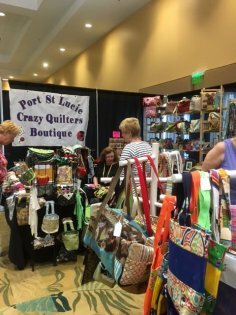 Happy - oops no picture of it at show yet but thank you Karen M of Creative Longarm Quilting for the quilting. 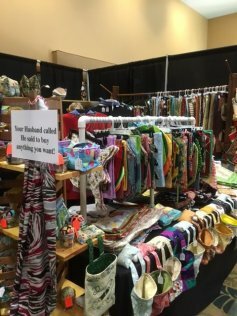 I will send some picture tomorrow but remember we have a wonderful Boutique. Love this shot of "Your husband called and said to buy anything you want!" 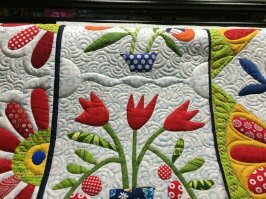 And tomorrow if you are coming yo the show......WEAR RED so you can enter our drawing for a Quilting Basket full of $1,000.00 worth of supplies.....and remember to care for your heart!!!!! 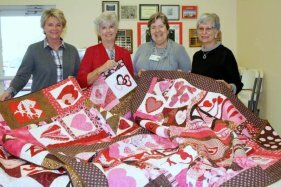 Each day will be an auction for one of the Heart Quilts.....all proceeds will be given to the American Heart Association Go Red for Women. Also take a picture in THE DRESS. Thanks to quilter Teri Tope for loaning us this charmer. It is a quilt no it is the body we all dream of. Just remember your HEART.